Getting comfortable with a treadmill is easier with proper running form. The treadmill can offer you an excellent workout that’s similar to walking, jogging and running outside. To get the most out of your treadmill experience, you’ll need to become familiar with the equipment before starting your workout. You’ll also want to maintain proper form while performing your workout to prevent injury. Check the safety of the treadmill. Before you even turn on the treadmill, step on the platform to make sure it feels solid and not wobbly, suggests the American College of Sports Medicine. Check the belt to make sure it's in good condition. 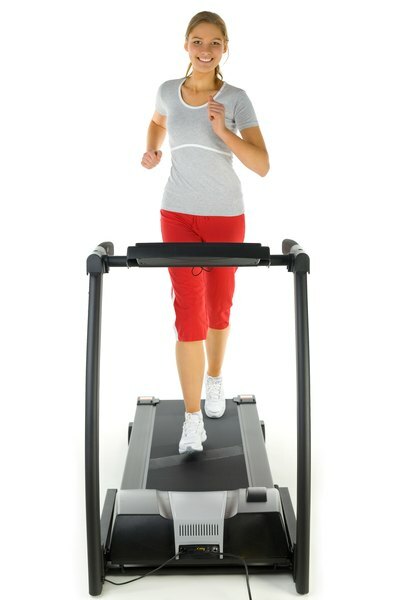 There shouldn’t be any parts jutting out from the treadmill that could impede your natural running movements. Make sure the side bars are sturdy and far enough away from the body so you will not come into contact with them during your workout. Find the emergency shut-off key and make sure it works properly before you start your workout. A tether shut-off key is preferable since push buttons may not be within reach if you fall while you are on the treadmill. Experiment with the treadmill’s controls. Familiarize yourself with the varying speed and incline buttons before starting your workout. Most treadmills offer programmed workouts such as hills, fat loss or pyramids. This can allow you to get an excellent workout without having to manually change the incline and speed as you are running or walking on the treadmill. Use proper form when exercising on the treadmill. If you’re a runner already, the treadmill may wreak havoc on your running mechanics. It might take a runner some time to get used to the moving belt. Runners who are new to the treadmill tend to lean ahead at the waist in an effort to 'keep up' with the belt, according to Running Planet. Stay upright and relaxed. You will need to lean forward slightly starting at your ankles, but do not lean forward just at the waist. Keep the chest pushed out with the shoulders staying back and relaxed. Do not land on your heel with your foot in front of your body during the touchdown phase of your run. Instead, focus on touching down with the ball of your foot, keeping the foot directly under your center of gravity, suggests Running Planet. Count your strides for one minute while running on the treadmill. You’ll know you’re using proper form if you hit 85 to 95 full strides per minute, suggests Running Planet. Less than that means you’re spending more time on your feet than you should be. If you listen to music or watch television while working out, have your music player or TV set up the way you prefer before you start your workout. Keep a water bottle within easy reach. 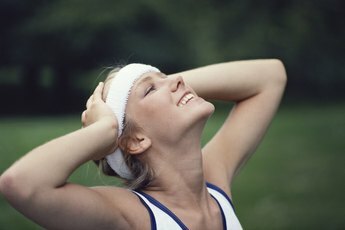 Do dynamic stretching before your workout and static stretching after it. If you find yourself lightheaded while on the treadmill, you should stop immediately and rest. This occurs when not enough blood is getting to the brain, according to Medline Plus. It can occur if you’re dehydrated or have a sudden drop in blood pressure. Don't push yourself too hard during your workout and make sure you have fueled up properly before you start. 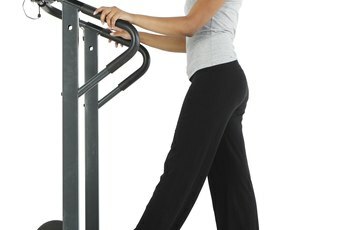 Can Walking on a Treadmill Cause Swollen Ankles? Do You Work Your Abs Less on a Treadmill Than Running Outside? Can Treadmills Make You Lose Weight?